Donald Trump is six months into the U.S. presidency, and opinions about his job thus far certainly fall all along the spectrum of approval or disapproval. One fact that can’t be overlooked is that President Trump has embraced the guidance of Christians who helped elect him. A new book from Charisma Media CEO Stephen E. Strang, who strongly backed Trump in the election, will consider how the president’s faith has perhaps grown and strengthened in office. 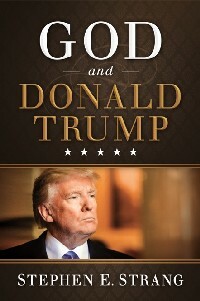 God and Donald Trump (FrontLine/Charisma House), to be released Nov. 7, seeks to help readers understand who Trump is, what he really believes, where his vision for America will lead the country and where God is in all of this. After interviewing Trump, Strang, an award-winning journalist, founder of Charisma magazine and successful businessman, was involved with other Christian leaders who campaigned for Trump’s election. Strang also attended the 2017 election-night victory party in New York because he believed the prophetic ministers who said Trump would win.